Moses lifts his slingshot and shoots the snake with an alabaster marble. Angrily the snake shakes its side scales in a threatening rattle. “No quitsies,” the boys laugh. 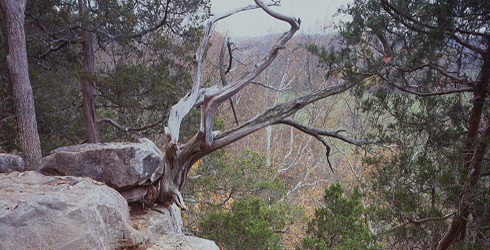 The two boys are playing on cliffs near their home in southern Illinois. It is early morning. From the cliffs, you can see farms in the valley below. An open-cab combine moves slowly through a hayfield in the distance. The boys have slept on the cliffs all night in a tent made of bed sheets donated by their mother. Moses stands on the edge of the cliff and looks through the trees below. Cottonwoods, elms, oaks, firs, cedars. The two must climb the cliffs at night to prevent Aaron from seeing below as he climbs. As the sun rises, Moses stands with his arms outstretched and stares through the jagged branches. Even standing close to the edge scares Aaron. From his perch inside the tent, he looks at the thin tree trunks and imagines what it would be to put his foot on the top of each limb and balance from tree to tree. A dense smoke turns over in the fields, and the whole earth seems to move like a fish rolling through water. This is the summer of 1978. A year later Moses is killed in a tractor accident. He is 16 years old. After they cut the clothes off the boy’s body, his mother keeps them in a drawer in the boys’ room, washing and drying them occasionally then smoothing the cloth out with her hands. “That’s the only way to get the wrinkles out,” she says. Aaron Green lies on a cot looking at a wall across from him. 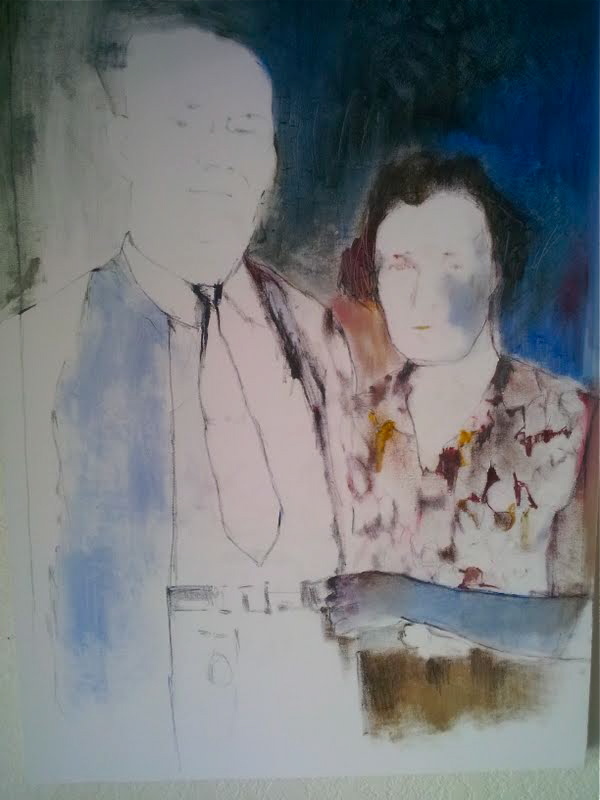 Leaning against the wall is a painting of a man and woman. The woman wears a blouse sketched with red and yellow flowers. The man wears a suit jacket and tie and carries a watch chain. She curls her left hand and fingers around his lapels like a child clutches a blanket. The fingers and arm that hold on to the lapels are blue. Each night when Aaron can’t sleep, he stares at that one blue arm, wondering why the artist chose that color. A few lines around the woman’s eyes seem to ask what is it I have become. The faint smell of linseed oil keeps Aaron awake. He sleeps in a small room attached to the art studio in a state college where he has worked for 20 years in maintenance and facilities management. Many staff and faculty members have been laid off recently after budget and funding cuts. He is sleeping in the art studio until he can find a new job. Each morning before school opens, he walks to a coffee shop to eat breakfast. He doesn’t know how much longer he can remain stowed away in the art studio or how much longer his money will last. formed by shadows in branches and leaves. the face of a child face down. in that land I do not see.